In early 1946, the British government tasked W.D. 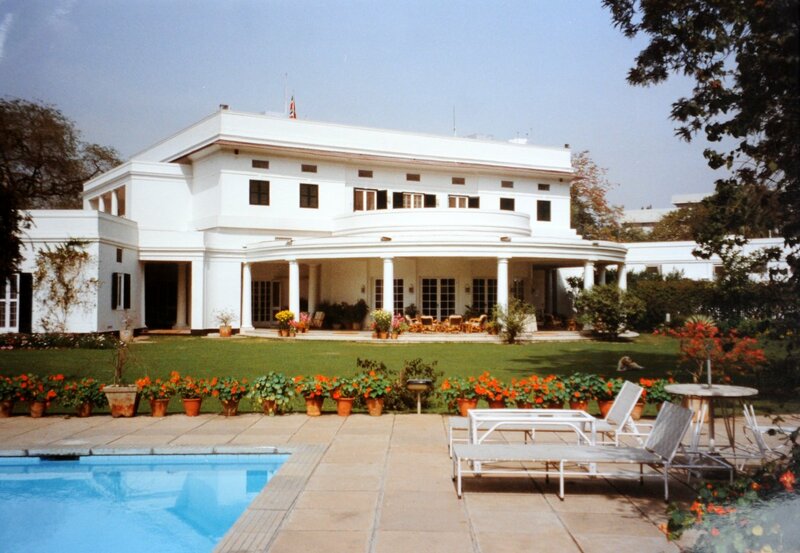 Croft, an India Office official serving in the Office of the Cabinet Delegation in the Viceroy’s House in New Delhi, with making recommendations for the provision of accommodation for the future high commission. Croft reported that all accommodation was exceedingly tight, most houses were already shared, and many senior people and their wives were living in hostels. He concluded that there was no alternative to dealing direct with the Government of India, which had requisitioned a great deal of property during the war. The Viceroy, Viscount Mountbatten, though keen to see the high commissioner installed as soon as possible, was not prepared to countenance pressure being put on any of the Indian princes for a de-requisitioned mansion. For a residence for the future high commissioner, Croft proposed No. 2 King George Avenue, a well-sited but unexceptional two-storey official bungalow on a central circus with a large and fine garden. It had formerly been occupied by Sir G.S. Bajpai, secretary-general of the ministry of external affairs, and was now being shared by several senior Government of India officials. Croft thought ‘this house is quite good enough to start with, and … it would be a very difficult matter to get anything else’. Despite the Commonwealth Relations Office’s dismay that 2 King George Avenue was not prestigious enough, London quickly authorised negotiations for its pursuit. The residence, across the garden, 1992. Croft had identified various works that would be necessary to make the house more suitable for a diplomatic residence, including enlarging the drawing room, improving the staircase, and rearranging the bedrooms and bathrooms. Henry Medd, chief architect to the Government of India and formerly a long-serving member of Lutyens’ office in Delhi, and Alexander Scott, the surviving partner in Sir Herbert Baker’s firm, were both on hand to give advice. Adaptation work by the Public Works Department, estimated at about £6,600, started promptly and was optimistically intended to be completed in November 1946. The scope of work expanded, however, notably after the involvement of the first high commissioner, Terence Shone, who arrived in early November, and the work dragged on until the Shones finally took up occupation in April 1947. Richard Turner, the Ministry of Works’ senior architect at Cairo, visited during this period to assess a looming 250% overspend. He recommended, successfully, that the Ministry of Works should establish an office in New Delhi to bring better order to projects in India in the future. Arguments about responsibility for the residence overspend and whether stamp duty was payable on the lease transaction delayed until 1954 the actual signature of the 10-year lease that had come into effect in 1946. The residence, however, proved such a success that the lease was renewed for a further thirty years in 1960. For the high commission’s first offices, Croft recommended No. 6 Albuquerque Road, a large new house, without any ‘aggressive errors of taste’, which had been requisitioned from the Khan of Badreshi as soon as he had built it and was being used as an army hostel for officers and their wives. Croft thought a three-year lease term would be negotiable provided that the house and the hutments in its garden were used intensively enough by the high commission not to create disparity with prevailing local practice. In contrast to the delays at the residence, the offices at 6 Albuquerque Road were operational in September 1946 and included a flat for the deputy high commissioner. But staff numbers in New Delhi, especially of junior and unmarried staff, shot up and 6 Albuquerque Road was soon over-crowded. Two additional clusters of buildings were acquired, even though the market was scant and expensive. One was Eastern House on Mansingh Road, comprising five blocks that had been built by the Ministry of Information in 1944 and transferred to the Government of India in 1945 at a time when, strangely, no further British government use for them was envisaged. Eastern House was therefore leased for the high commission in 1947 to house the trade commission and information service offices, as well as flats for about 40 junior staff and a sick bay. The other cluster was at 16 and 17 Parliament Street. No.16, called Wenger’s Flats, comprised 40 flats just suitable for higher and middle grade staff, and a perpetual lease on the block was bought in 1949 from the Sterling General Insurance Co. Ltd. No.17 was a large adjacent house suitable for communal messing, and was bought in 1949 from Sardarni Harnam Kaur. Unsurprisingly, none of these arrangements was popular with the British occupants but they had to suffice for the next fifteen years while a large new compound was being planned and built. Once all the offices had moved to the new compound, Nos.16 and 17 Parliament Street were sold, and Eastern House handed back to the Indians, in 1962.